This guide talks about how to deploy Hasura GraphQL Engine on Azure using Container Instances with Azure Database for PostgreSQL server. The actions mentioned below can be executed using Azure Portal and Azure CLI. But, for the sake of simplicity in documentation, we are going to use Azure CLI, so that commands can be easily copy pasted and executed. As the name suggestes, Resource Groups are used to group together various resources on Azure. We’ll create a resource group called hasura at the westus location. If you already have a database setup, you can skip these steps and jump directly to Allow access to Azure Services. <server_name>.postgres.database.azure.com is the hostname here. If you get an error saying Specified server name is already used, change the value of --name (<server_name>) to something else. If you’d like to connect to an existing database, use that server’s database url. %40 is used in the username because Azure creates usernames as admin-user@server-name and since the database url uses @ to separate username-password from hostname, we need to url-escape it in the username. Any other special character should be url-encoded. If the <dns-name-label> is not available, choose another unique name and execute the command again. Output will contain the FQDN in the format <dns-name-label>.westus.azurecontainer.io. Replace <dns-name-label> with the label given earlier. You can create tables and test your GraphQL queries here. Checkout Making your first GraphQL Query for a detailed guide. If your password contains special characters, check if they were URL encoded and given as environment variables. Also check for proper escaping of these characters based on your shell. 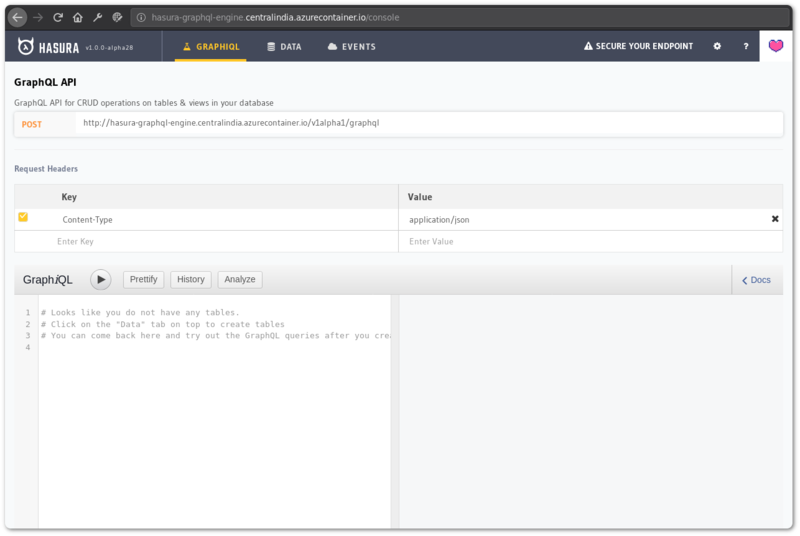 You can check the logs to see if the database credentials are proper and if Hasura is able to connect to the database. If you’re using an existing/external database, make sure the firewall rules for the database allow connection for Azure services.